For optimum performance, use only genuine CEM Trac film, Trac tubes and sample pads in the SMART Trac System. CEM's proprietary Trac film and tubes are proton-free components specifically designed to be used with the SMART Trac and will not interfere with the NMR analysis. They are manufactured to the highest standards to ensure accurate results. Trac film consists of a proprietary chemical composition which ensures an absolute minimum in interference for fat determination by NMR. CEM Corporation individually tests each batch to ensure that this standard is continuously met. Therefore, when using CEM’s Trac film you will ensure the best performance possible with your Trac system. Trac film, developed by CEM Corporation is protected by worldwide patents in the US, Canada, Europe, and Japan. Use of any non-CEM film is in violation of these patents and will compromise the performance of the Trac system. This includes the performance of all methods transferred onto the system that were developed with CEM Trac film. Additionally, the use of a non-CEM film substitute may lead to voidance of the system warranty or service contract. 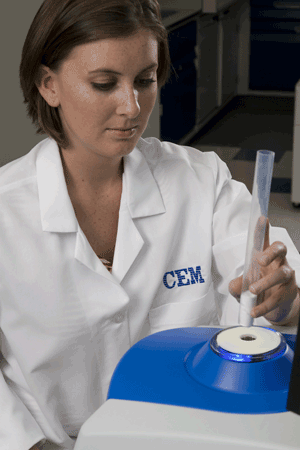 CEM sample pads consistently provide the test accuracy and precision demanded for Process and Quality Control. 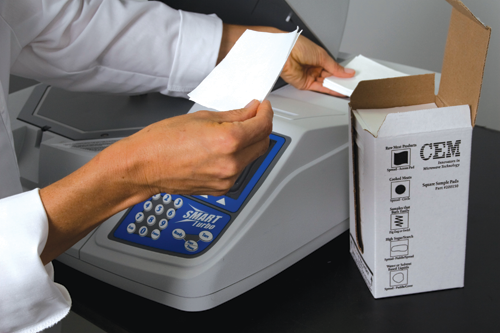 We manufacture our sample pads in a controlled environment to avoid excess moisture, which can cause erratic and inconsistent numbers. Our pads are tested to ensure they meet strict requirements for absorbency, moisture content and mechanical strength. They are approved for use in AOAC methods.